Who’s Ready for a Scavenger Hunt? Night Owl Romance is about to launch this year’s HALLOWPALOOZA event, and once again, I’m one of the sponsors with my featured title, BETTER THAN CHOCOLATE. There are over 100 prizes for eager book lovers, including book giveaways by participating authors, Amazon gift cards, and the Grand Prize, a Kindle Fire HD 8 with Alexa! For more info, be sure to check out the Scavenger Hunt, happening October 11th through 31st over at Night Owl Romance. I’m very excited to announce that I’ll be participating in Romance Writers Gone Wild, a week-long Facebook event that will spotlight 130+ romance authors in genres ranging from contemporary to historical to paranormal and suspense (and just about everything in between). The Facebook event page is open and anyone can join the party! The week before the event, authors will begin introducing themselves, so be sure to check everyone out. 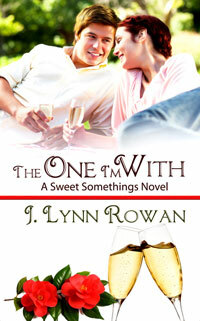 THE ONE I’M WITH will be here next Wednesday, and is officially up for pre-order in Amazon’s Kindle Store. *Just a reminder that as long as you have a device that will run the free Kindle reading app, you’ll be able to enjoy THE ONE I’M WITH. The giveaway will run from midnight on October 5th to midnight on October 20th. All winners will be notified no later than 11:59pm on October 22nd. Click the link below to enter starting October 5th! As always, be sure to sign up for my email newsletter, and follow me on my socials, Goodreads, and my Amazon Author page! Stay tuned over the next couple weeks to learn more about our main characters, Marissa O’Brien and Josh Mattingly, and of course, get a sneak peek at Chapter 1! WHEN IN ROME Release Day Giveaway – Winners Announced! I’m very pleased to announce the winners of the WHEN IN ROME Release Day Giveaway. And remember, if you’ve read BETTER THAN CHOCOLATE and/or WHEN IN ROME, please don’t forget to leave some reviews on Amazon and Goodreads, and of course tell your friends! If you would like to stay in the know about future giveaways, releases, and other special things in the Awesomesauce category, remember to sign up for my email newsletter, and follow me on my socials, Goodreads, and my Amazon Author page! And speaking of upcoming Awesomesauce, I have a great series of posts planned for the next few weeks. Get your passports ready! There’s a very cool contest going on through the month of February over at Night Owl Reviews. If you’re looking for some new books to read and want to win some prizes, this might be the contest for you. I’m a sponsor for NOR’s “Love is in the Air” contest, which runs February 4th through February 27th. It’s a scavenger hunt, and BETTER THAN CHOCOLATE is one of the featured titles. Prizes range from $5 to Amazon all the way up to the $100 Amazon Gift Card Grand Prize. Of course, it’s not all about the virtual money. There are a ton of great reads that are part of this scavenger hunt, and with Valentine’s Day just around the corner, it’s a great way to get in the mood for some romance! Check out the contest page over at Night Owl Reviews for more details and to enter!